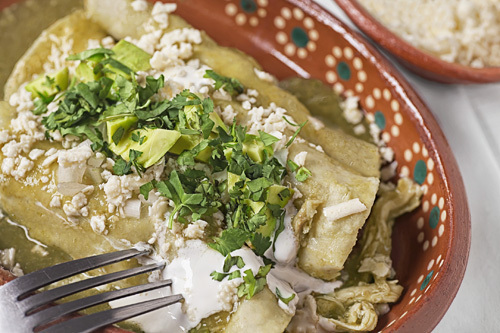 The enchiladas are without a doubt, one of the most popular dishes of the Mexican gastronomy. In fact there are so many variations of this dish that it is impossible not to find one that we like. When the enchiladas get to the table, the first thing that it is seen are many fresh ingredients over a salsa layer. These ingredients are cheese, onion, avocado, cream and coriander; which are used to garnish the enchiladas. Underneath these ingredients are the enchiladas, that are lightly fried corn tortillas that in this case are filled with shredded chicken . But the best part is about to come and that is when all these ingredients are tasted together. It is a magnificent combination of freshness, flavor, hotness and of Mexico . The enchiladas are served as a main course and they can be accompanied with refried beans , red rice or white rice. It is a bit laborious making the enchiladas since there are many steps to follow. But don’t worry everything is explained in detail. In this recipe we are going to fry tortillas therefore don’t use olive oil because it burns quickly – it is better to use a vegetable oil. Make homemade corn tortillas and use them to make these enchiladas. It is very important to use fresh coriander to garnish the enchiladas. In this way they will have more color and more flavor. The enchiladas will be ready in 30 minutes . The recipe for 10 green enchiladas. Put on a large plate the fried tortilla with salsa and put over the tortilla some of the chicken that was shredded. Variation: Would you like to taste these enchiladas with cottage cheese ?